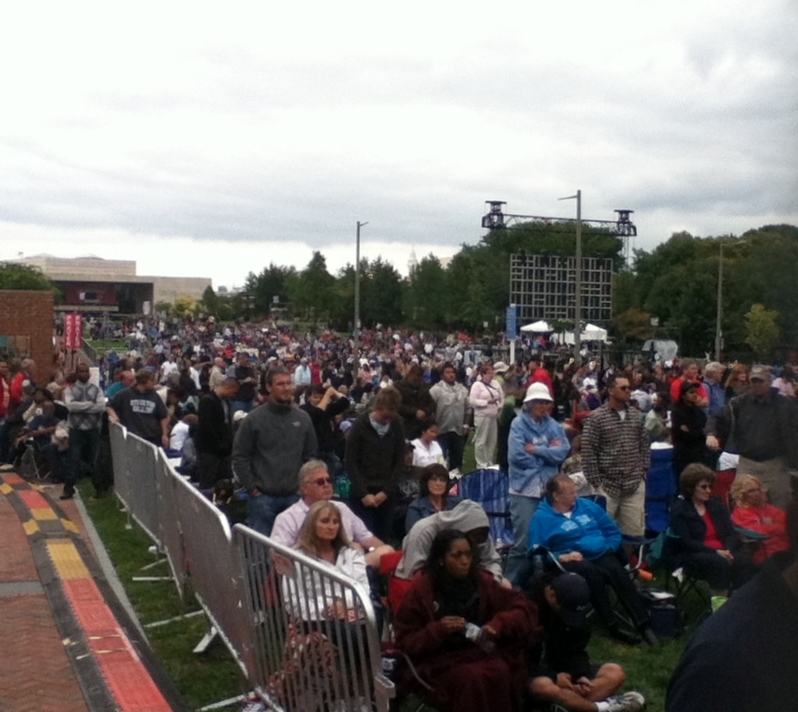 Thousands gathered in Philadelphia, Pennsylvania this weekend for a large-scale prayer event called America for Jesus. While some openly welcomed the gathering, others expressed concern over the apostasy of a number of the scheduled speakers. As previously reported, America for Jesus is led by megachurch speaker and author Anne Gimenez of Rock Church in Virginia Beach, Virginia. Gimenez, who preached several times during this year’s event, was ordained at the age of 19 and began preaching throughout the South. Following the passing of her husband John in 2008, Gimenez took over the leadership position at Rock Church. She later wrote a book called Born to Preach, with the foreward written by Pat Robertson of The 700 Club. Gimenez and her husband began hosting America for Jesus rallies in 1980, organizing gatherings in various parts of the country. Her son-in-law, John Blanchard, who coordinated this year’s event in Philadelphia, has been involved since 1996. “We’re praying for a revival, and we’re praying for an awakening in America,” he stated. America for Jesus featured a number of well-known speakers, such as Pat Robertson of The 700 Club, Lou Engle of The Call, Tony Perkins of Family Research Council, Cindy Jacobs of Generals International, Rick Scarborough of Vision America, Robert Stearns of Eagle’s Wings, Rick Joyner of Morningstar International, Rabbi Jonathan Cahn of Hope of the World Ministries, Chuck Pierce of Glory of Zion International and many others. Local guests included Pennsylvania Senator Stuart Greenleaf and Philadelphia Deputy Mayor Richard Negrin. In addition to live messages, video prayers and commentary were broadcasted from Joel Osteen and Billy Graham. Music was also performed by a number of bands, choirs and soloists, including Rick Pino, Sean Feucht and Ricardo Sanchez. During the week, Bill Johnson of Bethel Church in Redding, California, Cindy Jacobs, Dutch Sheets, Harry Jackson, Doug Stringer and others spearheaded an event that it is a part of the effort, called Awake Now. The meeting was held at Living Faith Christian Center in Pennsauken, New Jersey. However, many have expressed concerns over the gatherings, both spiritually and politically. “[T]he sickening reality is more and more so-called Christians are so enamored by well-known preachers that they are choosing to close their eyes as the blood of Jesus is trampled upon and the Spirit of grace is insulted, rather than have the reputation of their beloved men of God tarnished in any way,” stated Tom Tomasella of Safeguard Your Soul. Many of the speakers that were scheduled to address the crowds at America for Jesus and its surrounding events raised concern because of the beliefs that they espouse and teach. Bill Johnson, who was at the forefront of Awake Now conference, adheres to the doctrine that Jesus went to Hell as a sinner. Similarly, many have decried Cindy Jacobs, Chuck Pierce, Robert Stearns and others as being false prophets. Jacobs has asserted that a large signs and wonders movement is coming to the nations. Jacobs also claims that one of her staff members was personally visited by the angel Gabriel, who explained why her ministry was experiencing financial difficulty. She said that Gabriel replied that there were “four vortexes of demons” that had been assigned by the Devil to hold funds back from her. Rick Joyner, who spoke on Saturday, serves as the spiritual adviser to Todd Bentley, a famed “faith healer” who is known for his claims that God told him to kick sick people in the face. Bentley stepped down from his “revival” meetings for a time, and re-emerged with a new wife — the young nanny that took care of his children. Many have also dubbed Joyner a Gnostic and have denounced his book The Final Quest, in which he wrote that he had a vision where he spoke to a dead man that was released from Hell after repenting. Therefore, while thousands flocked to participate in this weekend’s America for Jesus event, others stood outside of the gathering to urge Christians to not yoke together with false teachers. 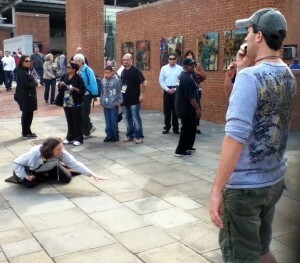 Michael Marcavage of Repent America preaches to the crowds while a woman acts erratically. The evangelistic ministries Repent America and Cross Country Evangelism were among those preaching against apostasy at the event. Marcus Diaz from Irvington, New Jersey, erected a prayer stand at America for Jesus and spoke with a number of attendees as well. America for … Obama or Romney? As Family Research Council’s Values Voter bus pulled into the event to distribute voter guides and discreetly influence attendees to vote for Republican candidate Mitt Romney, Marcavage said that he had numerous conversations with attendees about how they will cast their ballot this November. Many of those attending America for Jesus, like Family Research Council and a number of the featured speakers, were supportive of Romney. Pat Necerato of VoteBiblical.com joined Marcavage and others to reach out to attendees Friday night. Similarly, Tony Perkins of Family Research Council told the audience that he was not at America for Jesus for political purposes, although his values voter bus was present to distribute voter guides to attendees. Perkins has also publicly endorsed Romney. Anne Gimenez, who founded the event, outlined that she does not limit her voting practices to Christians. Speaker Rick Scarborough of Vision America and organizer of the ecumenical joint prayer effort “40 Days to Save America,” agreed. As previously reported, while Scarborough believes that Mitt Romney’s “track record is suspect,” including his views on homosexuality and abortion, he feels that he must vote for the Mormon candidate anyway. However, Marcavage contended that such reasoning is not Biblical. The event concluded Saturday night at Independence Hall in Philadelphia.